SEO, which is also known as search engine optimization, implies a process that includes some procedures that should be applied to a website to help it to appear to the search engines. The techniques may be different. They depend on the industry. The main algorithm of work is based on the basic white hat tactics that should be followed on a regular basis. The whole strategy should be centered on keywords. The improvement of the chances to show up in different search engines is usually made by targeting certain words for a certain website. In other words, if people want to find information using a certain keyword, a site owner should use a variety of white hat tactics to help to a website to return it in the search results. If you are struggling with getting more web traffic, it may happen because you didn’t employ SEO at all capacity or made some mistakes while optimizing your website. Keyword cannibalization is one of them and we will take a closer look at it in this post. Keyword cannibalization sounds pretty awful, doesn’t it? Unfortunately, a lot of websites have this problem. It occurs some subpages have the same keyword what they are targeted for. Of course, most of the search engines learned how to detect that page which is the most relevant for a certain keyword but still this issue is widely spread. Mostly, keyword cannibalization is caused unintentionally by an internal information structure, or, what is more possible, by ‘good intentions’ of a website owner. The most common case when the keyword cannibalization happens is if a website owner adds additional content to his site and chooses those keywords that are already used for targeting. They believe that such practice will result in additional traffic. Unfortunately, such actions have the opposite effect. The thing is that quality of posted content will be diminished over time because a writer covers the same subject for a few times. Also, those websites which contain category pages with similar or identical nature can face cases of keyword cannibalization. To not let the scenario happen a website owner should avoid similar category pages that may compete against each other, make sure there is a correct page ranking and think about the structure of content and implementation of keyword targeting. There is a certain need to make it clear to search engines that category pages are related to unique business areas even though they have the same theme. Sometimes the result of the websites CMS configuration is internal duplicate content issues which, in its turn, lead to multiple page URLs with very similar content that appears on a website. If such URLs don’t have properly set canonical tags then the keyword cannibalization will probably occur. Why the cannibalization phenomenon is that bad? Let’s imagine your have a website with lots of pages and content on them. When Google sends its bot to scan your site and finds pages with the same keywords that were used for targeting it will not simply know which of those pages is the most relevant for a certain query. The same happens when such mistake as adding the same term toof pages is made. Conversion rate. As a rule, when cannibalization happened to your website, it means you waste the most valuable thing – time – on different pages having the same goal. There is no point to do that if one of the pages converts better than others. The solution is to focus all the efforts on one of such pages instead of spending time on those that have lower-converting value. Content quality: when targeting many pages with the same keyword, you probably pick the same subject for them. In such case you risk to have duplicate content, also the quality of your content will be poor. In the end, you will lower your chances to get referral and links by your own hands. External links: External links can increase SEO value of that page which targeting one keyword. But in case of keyword cannibalization, you have different pages that are targeting the same keyword. The result of such method is low efficiency of your external links. In simple words, they will be splitted between different landing pages and, thus, the external link value will be shared among different pages but could be focused on one. The easiest solution is creating a keyword map. It will help to prevent this issue and avoid its negative impact on your site. The process can be compared with making an outline for your future article. Such method provides a path on how the optimization should be done. The steps of building it depends on the type of a website. Content. If there is any, look for keywords that were used for it. Competitors. If your website has direct rivals you can cheat a little bit. Go to their website to conduct the analysis of content in search of valuable keywords. They may be your terms which you can use for your website targeting. Check with your client what keywords matter and what they wanted to use for SEO. Existing website. As a rule, a home page has rankings for many targeted keywords. That’s the example of what you shouldn’t do when optimizing a home page. On existing websites there are many keywords that will help you to create a keyword map. How to create a keyword map for an existing website? The process of creating a keyword map for your website has several stages. 1Crawl your website to get a list of the pages the website has. Please note, not all of these pages should be optimized for SEO. Consider this rule while crawling to not waste your time on those pages which you don’t want to include to the list of ‘need to rank’ ones. 2Add columns for the keywords. What is the best number of terms? There is no exact ‘perfect’ number for them. On average, there will be enough up to 5 keywords. Such amount will give you a choice for variations of target terms. 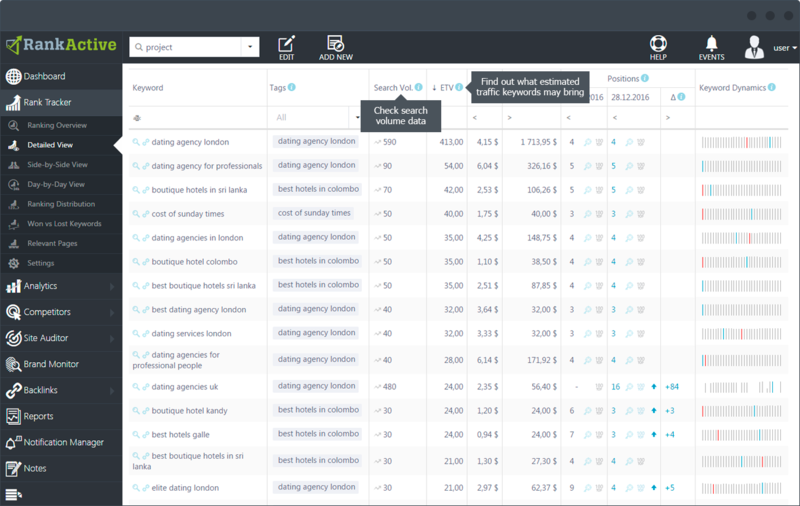 By the way, you can add such information as search volume for the keywords or their current positions to choose which keywords are better to leave for targeting. This information is available for estimation at the RankActive platform. 3Detect duplicate keywords that are targeted. For this you will need some skills or experience of work with the Excel files. After all the keywords are added choose Conditional formatting option at your Excel file. Then you will be able to create a rule for your formatting by adding those keywords you want to find duplications for. The problem may not seem that big with my example, but if your website has lots of pages and keywords duplications, then you will face keyword cannibalization issues. 4Choose the most relevant page to a certain keyword. Analyse the received results to pick which keywords are best to use for the targeting of a page. In case if a keyword applies to another page try to find an appropriate variation of the term. Those four steps were some kind of prequel. Now it is about time for the real action. The main rule that you should consider while creating a keyword map is the relevancy of keywords across those website pages which require optimization. A lot of SEOs face the situation when keywords they want to choose for targeting may be already presented in the content that exists on the pages. That’s why you should appropriately complete the first four steps. You can check the rankings for the website according to the picked keywords to see if a page of the site ranks well for a highly relevant and valuable term. Don’t forget to include the information to the table. To determine such thing as relevance between pages you need to find out what page is the most valuable and relevant to the term, will probably result in some conversion or attract traffic to your pages, etc. Your main intention is to target variations of the keywords on each page providing the best opportunity to rank for the chosen term. For instance, there is an opinion that any home page should be targeted by branded terms or keywords that describe your main products or services. Consider what the main idea of the page is and use proper keyword for it. Thanks to such map you can easily choose the terms for targeting. So it will make the optimization process easier and your strategy more efficient. When you have completed keyword maps you will be able to jump straight into optimization of your website because the terms you want to target and guide your SEO efforts will be clearly shown. Having a map you will ease your work with such onsite elements as tags, headers and anchor text that have a pretty great influence on the efficiency of any campaign. 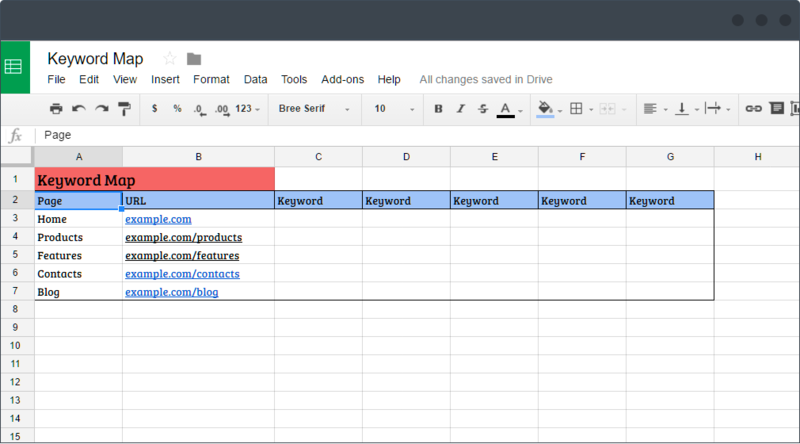 Also, keywords smartly picked for a map are an important resource that you can share with your content team to help them with the process of writing. In other words, keyword maps are like a guiding light in the darkest SEO night.